Posted in: BSU Journal Club. Tagged: astrobiology, Mars. 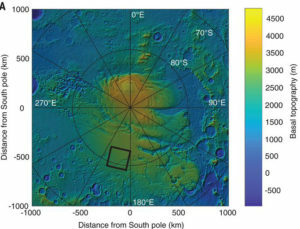 Map of Mars’ south polar ice. The colors show how thick the ice is, and the black rectangle shows the location of the newly discovered sub-surface lake. From Orosei et al. (2018). As summer winds down and we prepare for the fall semester, I finally found the time to read the recent announcement about finding sub-surface water on Mars using the MARSIS radar onboard Mars Express. Although evidence for liquid water on Mars has been reported for a long time, these reports are almost always about ancient flows or very modest, salty trickles (and the presence of water often turns out to be illusory). By contrast, if this most recent report holds up to scrutiny, there could be 10 billion liters of liquid water under the martian south pole. That’s not much on the scale of the Great Lakes (the smallest one, Lake Erie, contains 10,000 times more water), but it’s more than a thousand times the volume of tanks at the Georgia Aquarium, which hosts more than 100,000 aquatic animals. So the martian lake could easily host a microbial zoo (although no direct evidence for that as of now). As is common in polar regions on Earth, the martian water lies under kilometers of polar ice and is probably so cold it requires some kind of geological anti-freeze to keep from freezing solid (the kinds of mineral salts that can do the job are actually pretty common on Mars). The overburden pressure from all the ice also helps keep the water liquid. But the fact that the lake sits underneath so much ice raises an obvious question: how did the scientists spot it in the first place? The answer is related to why the recent wildfires in the west, in addition to fouling the air, have given us very lovely sunsets. Preferential scattering of blue light by the atmosphere. When it first leaves the surface of the Sun, sunlight is colored white. But as it passes through the atmosphere, the light (which is a wave of electric and magnetic fields, after all) interacts electromagnetically with the atmospheric gas molecules, which themselves contain electric charges. The closer the wavelength of the light ray is to the sizes of the molecules, the stronger this electromagnetic interaction and the more the ray can be diverted from its straight path. 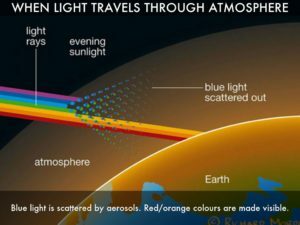 Since blue light has a wavelength (500 nanometers) closer to the size of the atmospheric molecules than red light (700 nanometers, it is more readily diverted or scattered. At dusk, as the sun sets, its light has to pass through more and more of the Earth’s atmosphere. So more and more blue light is scattered away, leaving behind more red light and making the Sun look red. If you sprinkle in lots of smoke from a wildfire, you can enhance the coloration. What does all this have to do with martian lakes? The MARSIS instrument used to find the subsurface lake uses very red radar light, with wavelengths tens to hundreds of meters long. Similar to red sunlight, such long wavelengths can easily pass through even solid rock since they’re much larger than the rocky molecules that make up the martian surface. Reflectivity of radar light from beneath the martian south pole. The bright patch at the bottom marked with “Basal reflection” is from the sub-surface lake. From Orosei et al. (2018). This explanation simplifies things a lot, but the upshot is that MARSIS could see the lake as a very unusual bright patch underneath all that polar ice. What’s next? It’s possible that continued data collection and analysis will turn up other subsurface lakes on Mars. If Mars’ south pole is brimming over with these icy lakes, it could be an especially good habitat for martian microbes. So maybe the effort to find martian life should explore using the same ice drilling technology being considered for exploring the oceans of Jupiter’s moon Europa.